Dojima explains the content of the special training and also the difference between regimental and normal shokugeki. The keyword for regimental shokugeki is 'teamwork'. Although the regimental shokugeki is a team battle, team members can help their teammate in the preparation and cooking and simultaneously also act as sous chef. The assistance and support from the teammates will increase the completion rate and the degree of perfection of the dish. Even if the individual's strength is insufficient, but as long the member can co-operate well with the teammates, there is a chance of victory for the team. To achieve the win, they have to build great teamwork surpasses their opponent's abilities. The discussion fails to continue further when two grown-up men, Dojima and Sabai arguing as they were during high school. Tadokoro determines to save her other eliminated friends whereas Erina has doubts about herself since she can't even stand up against her own father. A simulation battle between two teams has been decided by Erina's grandfather, Senzaemon Nakiri. Tadokoro joins Dojima's team together with Takumi Aldini whereas Erina joins Saiba's team with Soma. The first battle dish is comfort food in French cuisine, Hachis Parmentier. The time limit is 50 minutes. During the cooking process, communication among the team members is restricted. Dojima's team works well without any contacts whereas Saiba has conflicting ideas with his son, Soma which puts the team at the risk of disqualification. During the cooking process, both Saiba and Dojima uses their own cooking methods which are different from the traditional recipe. Their team members start to question whether both of the leaders are testing them. While there is a flashback of Takumi Aldini worked as a stagiaire in a traditional Japanese restaurant, he comes out with his own dish to respond with Dojima's ad-lib. This fighting spirit lights up the fire inside Soma. Soma begins his cooking, but Erina still feels lost in her team. She tries to recall her experience in Polar Star Dorm. The residents are insanely inventive which lead her to find answers to the questions that she never asks herself before. Finally, Erina ignores her perfectionist style and starts to cook. Both teams have their dishes ready, and each side will be tasting their opponent's dish. Erina even compares the opponent's dish as if she is listening to the best jazz band. Both teams keep arguing and praising their opponent's dish at the same time. The first simulation battle is a draw. The result is to show the strength of each individual and being recognised by their team members. Erina knows that she can't do the same thing as Soma if she faces her own father but her grandfather encourages her to be herself. The meeting to discuss the details of the battle is held at an abandoned station. The shokugeki will take place in a stadium at Rebun Island in a month, and ordinary students will be the spectators. There is no limit on the number of participants for the team. The winning team will take over all the elite ten seats. If Yukihira's team wins, Azami will no longer be the headmaster, and the Central will be disbanded. However, if the Central members win, the rebels will be expelled, and Saiba's diner will be closed down as well. Since Erina is one of the ten elite seats, Azami assumes Erina will be joining their team to fight against the rebels. Erina feels dilemma and Soma has already accepted the defeat of Erina to her father. Surprisingly, Erina decides to relinquish her position as the tenth seat and joins Yukihira's team to fight against the Central members as an ordinary student. Azami sets a particular condition for her. If her team loses, she will spend her entire life working for Central. Everyone is shocked that Erina finally can stand up against her father. Erina and Soma keep arguing to take the first seat. Dojima thinks back the time that his best friend, Saiba suddenly left the school. He feels discouraged and frustrated as he feels helpless about not being able to help his friend. He promises himself to guide the next generation. As the years passed by, when Soma joins the school, he tried to recall the phone call from his best friend who mentioned Yukira, and Saiba told him that he was cooking happily. Dojima feels grateful to Soma because the existence of Soma has saved his best friend to cook happily again. The battle finally arrives. Alice and others who had been expelled from the school also will be at Rebun Island to support the Yukihira's team. The arrival of the elite ten receives a big crowd of support. Yukihira's team found four more participants so that they have the same number of members as the opponent's team. This includes Isshiki-Senpai. Due to the equal number of members, the first battle will be three versus three. Nene Kinokuni will be facing Soma. Kinokuni-senpai is currently holding the sixth seat in the elite ten, and she possesses exceptionally high expertise in Japanese cuisine especially in soba noodles due to her family background. The third card draw for the theme ingredient is a disadvantage for Soma. While the spectators felt awe and impressed with Kinokuni's traditional skill of making soba noodles, their comrades are wondering what will be Soma's dish. Their self-defeat acceptance increases when Soma decides to cook instant yakisoba. The expelled students have been forced to watch the battle behind bars. Soma remembers that his father points out his biggest strength which is lacking in most of his opponents. He has accumulated experience as a diner cook. Soma continues his next step by using the machine to make the noodles. Although Soma's noodles have a remarkable feature in terms of the ratio of the flour, Kinokuni is confident with her own style of soba. She determines to maintain the traditional and not defeated by someone who is not up to the standard. I was so engrossed in reading this volume. This is getting more addictive. There were always so many life lessons to learn from the story or the characters. I can’t wait to read the next one. It might be a long-running manga, and you might be thinking when this is going to end, but sometimes, you just wish the mangaka won’t be running out of ideas and hope this manga will be ongoing as long as you want. 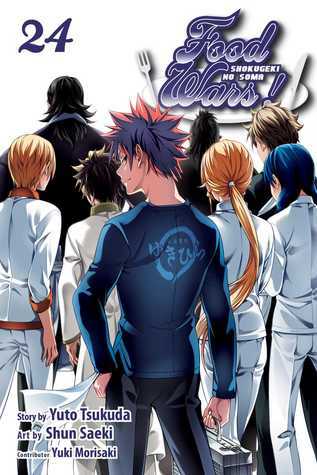 Previous volume: Food Wars Vol 23: He Who Opened a Path Through the Wasteland. More reviews can be found on Goodreads: Food Wars!, Vol. 24: Shokugeki no Soma - Welcome to the Final Battleground (Food Wars: Shokugeki no Soma #24).